If you haven't looked up from your screen recently, you might not be aware that it's Father's Day this weekend. In the spirit of all things Dad, I thought I'd post this video showing the incredible efforts that some Dads will go to in order to relive their childhoods please their children. I know it's from last year, but I still think it's really kewl. As for my little Dude, I'll show him this next week. I don't want to put this image in the Dude's head right before Father's Day and then have him tell his Dad, "yeah, you're ok but did you know that there's this Dad who..."
So, a word of warning: Show this to your children after Sunday. Spare your hubbies and Dads. 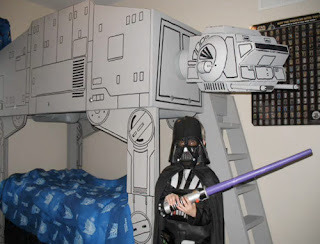 Read full post about Homemade AT-AT loft bed over at Boing Boing.